Amaretto is an almond-flavored liqueur that was originally developed in Italy. 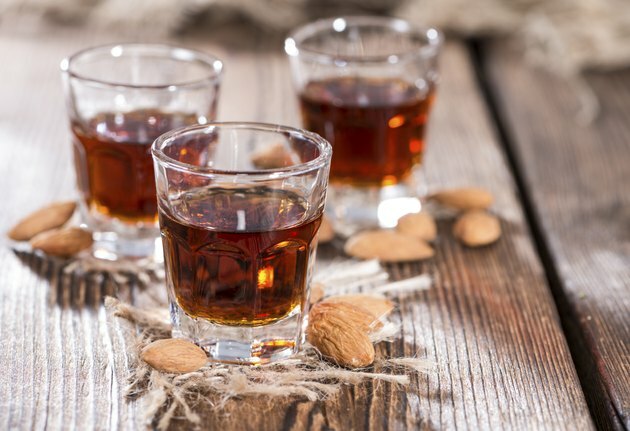 Although some brands of amaretto do use almonds in the distilling process, many use apricot pits instead, since they also impart an almond flavor. One ounce of amaretto has about 100 calories and is mostly carbohydrates, with few vitamins and minerals. Consume amaretto in moderation; the National Institutes of Health recommends that women have no more than one drink a day and men no more than two drinks daily. Amaretto is a sweet liqueur that typically serves as a before-dinner or after-dinner drink, straight up, or a flavoring for various desserts. A single ounce has 110 calories, 17 grams of carbohydrates, 3 grams of sugar and no fat, protein, fiber, cholesterol or sodium. Because amaretto has so few vitamins and minerals and no ingredients that are particularly filling, it’s fair to classify it as “empty calories,” along with many other alcoholic drinks. Amaretto's percent of alcohol by volume differs among brands. Common brands have a range of 24 percent to 28 percent, or 48 to 56 proof. Alcoholic drinks like amaretto have specific health effects on the body, both short- and long-term. In addition to impairing judgment, alcohol lowers blood sugar levels for up to 12 hours after drinking and can produce liver damage, gastritis and other severe health conditions over time. Its subtle flavor and sweet notes make amaretto a go-to addition to a variety of desserts. In those cases, it adds calories, carbs and flavor but not much else. One-half cup of amaretto almond ice cream, for example, has 270 calories, 17 grams of fat, 80 milligrams of cholesterol, 4 grams of protein, 24 grams of carbs and 22 grams of sugar. A tablespoon of amaretto-flavored coffee creamer has 35 calories, 1.5 grams of fat, no cholesterol or protein, 5 grams of carbs and 5 grams of sugar. Not all types of amaretto are made in the same way or have the same ingredients. Apricot pits are common bases, but some brands use almond paste or almond extract instead, and some have more added sugar and higher alcohol contents. The U.S. government does not require alcohol companies to disclose ingredients on their labels, however. A basic homemade amaretto consists of simple syrup combined with vodka, almond extract and optionally vanilla extract, and both homemade and commercial varieties of amaretto have relatively high sugar and carbohydrate contents. Beyond that, however, if you seek detailed information, you may need to go to the source. Contact the company that distributes the amaretto you have for accurate nutritional information.